Abney Park Cemetery is one of London's 'Magnificent Seven' Cemeteries established in suburban areas in the first half of the 19th Century. The Park has since stopped being a burial ground, and is now a fantastic nature reserve in the heart of Stoke Newington. The houses of Listria Park mostly back onto the cemetery, although they are separated by a large and imposing brick wall along most of the boundary. The houses along the road are predominately typical terraces found in this part of London. However, there is one house which is double fronted (instead of the usual single bay front typical along the rest of the street). It is assumed this belonged the builder of the street as they sometimes created an individual dwelling for themselves. This double fronted form created a very large roof space which was just used for storage. The owners wanted to create a full width loft extension which provided wide views of the Park from the newly created space. 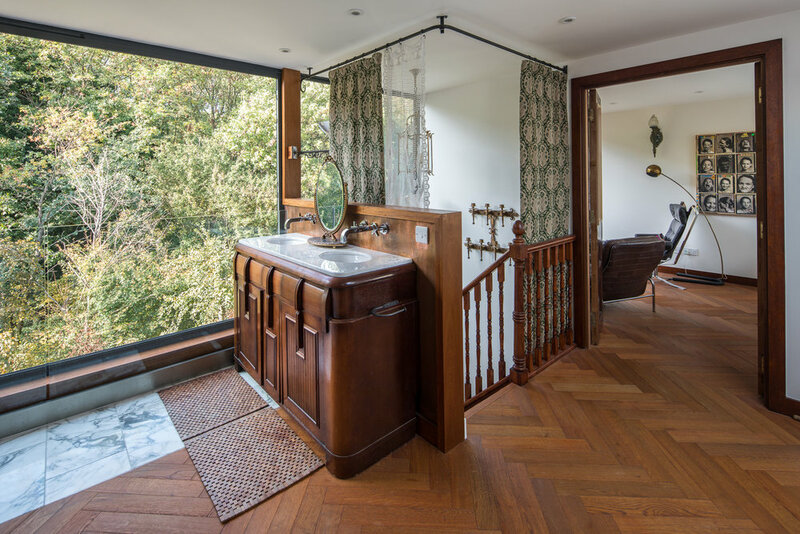 The loft features a shower room, bedroom and ample storage which enables the floor to be used as a self-contained 'master-suite' to the house. The fully glazed rear facade of the extension creates a green wall created by the large amounts of mature trees and planting in the Park beyond.